Ricke, K. L., J. B. Moreno-Cruz, J. Schewe, A. Levermann, and K. Caldeira, 2015: Policy thresholds in mitigation. Nature Geosci, advance online publication, doi:10.1038/ngeo2607. Some climate change impacts rise fast with little warming, and then taper off. To avoid diminishing incentives to reduce emissions and inadvertently slipping into a lower-welfare world, mitigation policy needs to be ambitious early on. Figure 1. Climate change impacts for various sectors. 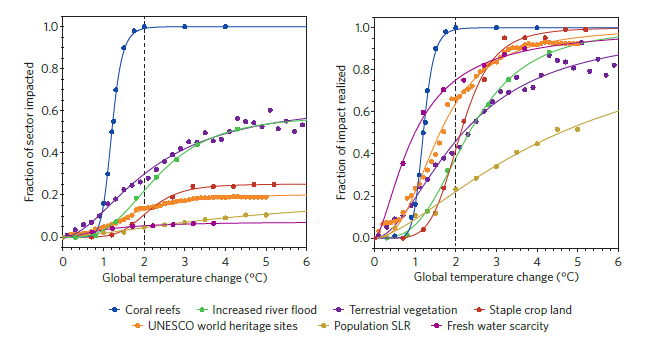 For climate impacts such as coral reef degradation2, river floods1, changes in terrestrial vegetation3, yield losses in staple cropland5, UNESCO world heritage sites in danger from sea-level rise4, population threatened by sea-level rise4 and population with scarce access to freshwater6, impacts rise steeply relative to the total expected impact at low levels of warming and then begin to saturate, usually as a result of either an approach towards the total potential loss or adaptation. The impacts displayed represent the median of an ensemble of simulations; lines are based on a sigmoidal fit. Impacts are normalized by the total sector size (left) and the maximum potential impacts (right) as determined by the sigmoidal fit, ranging from 10 to 100% of the sector for these examples.